Two men and one juvenile were in custody Saturday on suspicion of stealing a vehicle after a short police chase in Vista. Deputies spotted the vehicle at 8:53 p.m. Friday with no license plates and attempted to conduct a traffic stop in the area of West Vista Way and Emerald Drive, according to Frank Sandoval of the San Diego County Sheriff’s Department. When the driver failed to stop, a short pursuit ensued and ended when the driver collided with another vehicle in the intersection. 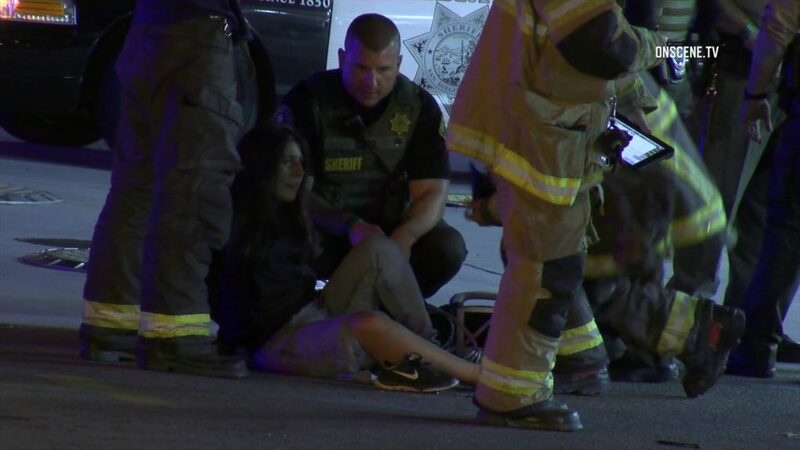 Five people, two men and three juvenile females, ran from the stolen vehicle at the scene of the crash but were quickly caught and arrested by responding deputies, Sandoval said. Two of the juvenile passengers were treated and released at Tri-City Hospital for minor injuries sustained in the crash, along with one person from the other vehicle, Sandoval said. The two men, whose identities were not immediately released, were booked into the Vista Detention Facility on suspicion of multiple felony crimes related to the vehicle theft and pursuit, Sandoval said. One of the teens was taken to Juvenile Hall, he added. The vehicle was reported stolen at 9 p.m. Tuesday from the 3900 block of Waring Road. The owner was flagged down by two males at that location requesting assistance with “jumping” the battery of another car, Sandoval said. When the victim stopped and exited his vehicle, the two males jumped into the victim’s vehicle and sped away, Sandoval said.